The Keyboard Composers of Mozart Era. 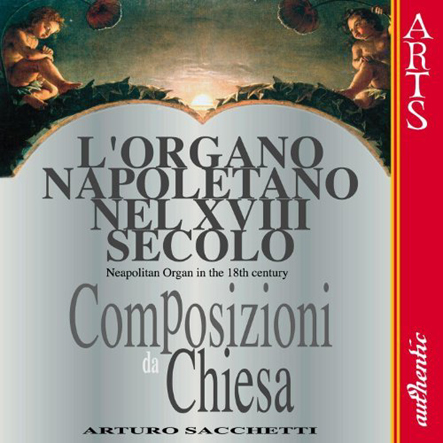 This rare CD Album Neapolitan Organ in the 18th Century gives us the possibility of listening to a series of extremely rare pieces for Keyboard of the 18th century and which were, instead, rather common in their days so that even Mozart and Clementi used to play some pieces from this repertoire, as we can learn from the letters written by the Mozarts. An example for all is given by the corpus of the keyboard music composed by the great Paisiello, a repertoire today almost entirely neglected. Just by reading the names of the composers selected for this CD Album, we discover composers who directly played some role especially in the life of Joseph Haydn and in that of Wolfgang Mozart. 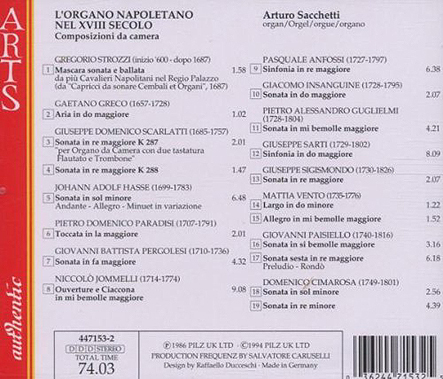 The close relation among the keyboard works by Domenico Scarlatti, Niccolò Porpora, Haydn, Farinelli, Metastasio and von Martinez is well known and we have treated with subject in detail in our paper The Scarlatti, von Martinez and Haydn Affaire (see The Bugler June 2016). Friend of Niccolò Porpora, the teacher of Joseph Haydn, friend of Metastasio, according to Burney, Hasse belonged to the Vienna faction of artists and musicians, who were fundamentally against Gluck and his friends. Hasse befriended Leopold Mozart and young Wolfgang Mozart, when most of Vienna had decided to reject them and their musical activity. Hasse considered young Wolfgang Mozart a great budding young composer and decided to actively support him and his father. Also thanks to Hasse's recommendations, the Mozarts, father and son, could organize their successful first Tour in Italy in 1770 and befriend Padre Martini in Bologna, a friend of Hasse, and find a good position in Milan for some time. 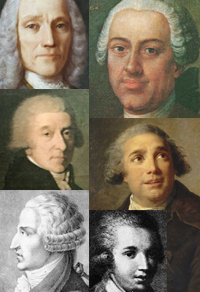 The operas by Pasquale Anfossi were rather popular in their days and a few works by him were used as style models by other composers of that period, like von Dittersdorf, who seems to have liked a few solutions suggested by Anfossi's technique of composition. Also Mozart studied Anfossi's works, but his encounter with this Italian composer was marked by the first very clash with Salieri in Vienna. The so called Anfossi Incident described in detail by Mozart himself in his letters took place, when Mozart was asked to write some substitution arias for an opera by Anfossi (a quite common practice in 1780s). Salieri strongly disliked the new arias by Mozart for Anfossi's opera and, enraged with Mozart, deliberately acted to boycott them during the performance of the opera, by threatening the singers. In Naples Insanguine was the teacher of composition of Stephen Storace, the English composer brother of the opera singer Nancy Storace, friend of Mozart and the first Susanna of Le Nozze di Figaro (1786). According to some people, Stephen became also a pupil of Mozart, like Attwood, however this is pure speculation and, in reality, it's more probable that Mozart was not more teacher of Stephen than of Michael Kelly. After all, Mozart was rather generous with his friends on the subject of suggestions on musical composition. The Storaces in Vienna in 1784 organized the famous quartet party with Haydn, Mozart, Dittersdorf and Vanhal and with Paisiello, as a special guest. Mozart considered himself a pupil of Padre Martini in Bologna and Giuseppe Sarti was also a pupil of Padre Martini in Bologna, before becoming the teacher of composition of the great Luigi Cherubini. So Mozart and Sarti belonged to the same circle of composers. This is one of the reasons, which led Mozart to insert the music from a famous and successful opera by Sarti in the finale banquet scene of his Don Giovanni (1787). In Vienna Sarti became a serious rival of Salieri with his operas, which the Viennese loved much more than Salieri's ones (von Zinzendorf). Mozart studied Paisiello's music for a long time and in detail, as Abert has revealed, and regularly used Paisiello's music as style model. In 1784 the two great composers met each other in Vienna and became friends and attended the same concerts and soirées for a few months and probably played also music together during such soirées. In 1786 Mozart's Le Nozze di Figaro premiered and the opera was conceived as the musical sequel of Paisiello's famous Il Barbiere di Siviglia. In 1781 both Mozart and Clementi had to play Paisiello's keyboard music during the famous musical duel. Cimarosa appeared in the life of Mozart in the final months of the year 1791. The new emperor Leopold II wanted to get rid of the artists and composers, who had worked for his brother Joseph II: he disliked Mozart, even though the reasons for this are still not completely clear, and wanted the power of Salieri at Imperial Court to be radically diminished. In conclusion, at the end of 1791, Salieri had to lose his position at Imperial Court and Cimarosa, arriving from Russia, received the position of Salieri, while Mozart was in his bed of death (5 December 1791). Cimarosa produced his Il Matrimonio Segreto (February 1792) with probably some musical homage to Mozart's music. But in March 1792 the sudden death of emperor Leopold II (probably assassinated by poisoning) changed the situation of Cimarosa. Cimarosa had suddenly to leave his position at Imperial Court and the position was given to Salieri again, Salieri, who kept it for ca. another 30 years. Cimarosa, like Mozart and like Leopold II, was thought to have died by poisoning by unknown enemies.